Terrorism may have been the motive behind Monday's terrifying attack at Ohio State University. According to new reports from the Islamic State's Amaq News agency, the Ohio State attacker was an ISIS “soldier,” a claim consistent with the attacker's newly released social media posts. The Somali native and United States permanent resident allegedly posted on Facebook warning that if the United States wanted “Muslims to stop carrying lone wolf attacks, then make peace with ‘dawla in al sham,’” an Arabic term for the Islamic State. The attacker injured 11 people during his brief spree Monday, first by ramming into several with his car, then continuing on with a knife. He drove his car up onto the curb outside Watts Hall, an engineering classroom building near the center of the large campus, at 9:52 a.m. before jumping out of his car with a "large knife," as one student described the weapon to CNN. No one was fatally injured except the attacker, who was shot by Ohio State Police Office Alan Horujko after failing to obey orders. The whole incident lasted less than two minutes, according to Monica Moll, director of Ohio State public safety, partially due to Horujko's rapid response time. 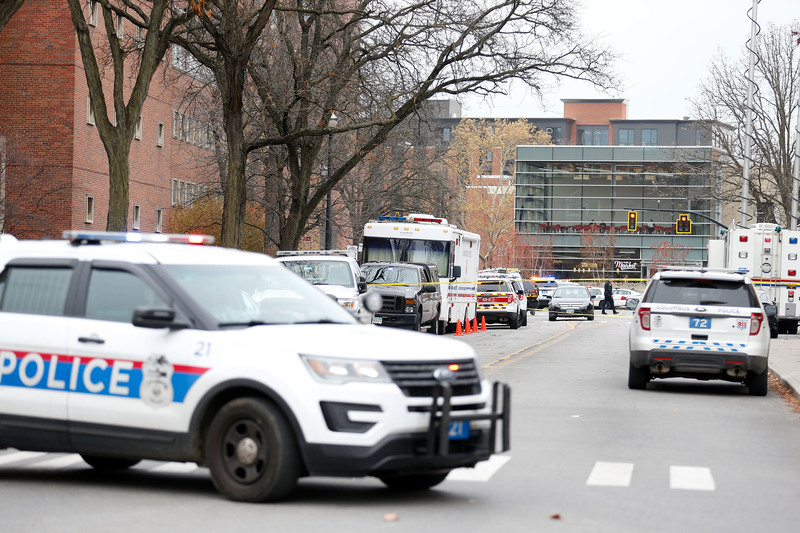 According to his Facebook posts and a recent interview with the school's "Humans of Ohio State" project, the attacker was becoming increasingly frustrated with and threatened by perceived Islamophobia. "I wanted to pray in the open, but I was scared with everything going on in the media," the attacker told the student newspaper The Lantern back in August, shortly after he transferred from Columbus State University. "I’m a Muslim, it’s not what the media portrays me to be. If people look at me, a Muslim praying, I don’t know what they’re going to think, what’s going to happen." It's unknown at this time if the attacker was ever the direct subject of any Islamophobic harassment or violence, or whether these were more generalized fears. The attacker also allegedly posted on Facebook about being "sick and tired" of seeing fellow Muslims "killed and tortured." "By Allah, we will not let you sleep unless you give peace to the Muslims. You will not celebrate or enjoy any holiday," he reportedly posted shortly before the attack Monday morning. More information about the attacker's connection to the Islamic State should be forthcoming as the investigation into the incident continues, but it could be as tenuous as his social media postings. Regardless, the attack is unlikely to ease the rising tide of anti-Islamic sentiment in the United States, which saw a 67 percent increase in hate crimes against Muslims in 2015.